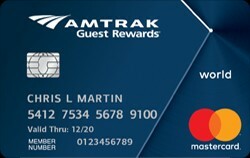 Apply for an Amtrak Guest Rewards Mastercard and receive 12,000 bonus points (enough for a free Amtrak roundtrip anywhere within a single zone), 5% of your points back every time you redeem them, plus the other benefits listed below. Other perks are double reward points for travel on Amtrak, 500 points with each Acela Business Class trip, bonus points with partners such as Hilton Hotels, Hertz, Teleflora with the Amtrak Guest Reward Mastercard from Bank of America. And did we forget, there is no annual fee.